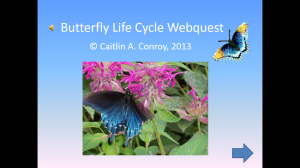 I had previously created a webquest on the life cycle of butterflies and frogs. I wanted to update these lessons, and I decided to give creating a webquest in PowerPoint a whirl. I thought PowerPoint would give me capabilities to meet criteria for creating a kid-friendly webquest for my primary students. I wanted to be able to insert hyperlinks obviously, but I wanted something that would be easy to navigate, and would allow me to embed video and insert photographs. I also wanted to be able to easily insert audio clips, because my students are emerging readers. Unfortunately, things did not go as smoothly as I had hoped. My students were reading an informational text titled Where Do Frogs Come From? So I set out to create my first webquest in PowerPoint on the life cycle of frogs. 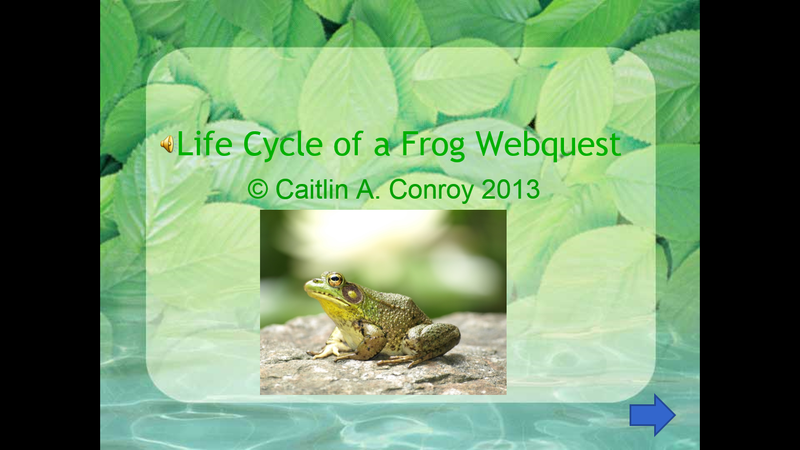 I spent hours working on locating resources, assembling the slides, adding clipart and lovely photographs of frogs taken by my aunt. I recorded audio clips, and added hyperlinks. I even put in an interactive, self checking quiz. I was pretty proud of the finished product, and I put it up for sale in my Teachers Pay Teachers store, and then my lesson totally tanked. I double checked the PowerPoint in school to make sure all the videos, links and action buttons were working properly, and everything looked great. (Sometimes I have issues because I have PowerPoint 2007 at home and 2010 at school). I posted my PowerPoint on my classroom Edmodo page. I thought this would be an easy way for students to access it. Boy was I wrong! I took my students to the computer lab, and after 30 minutes of running around like a chicken with my head cut off, I was still trying to get all my students logged into the computer, on the internet, and logged into Edmodo. When I finally got some of my students onto the Webquest videos weren’t loading, and it seemed that the PowerPoint security settings needed changed to enable the content. I called it quits, and had all my students go to starfall.com since our lab time was slowly dwindling away. I took my students back upstairs, and we explored the webquest together on the IWB, but it wasn’t the personal, self-paced lesson that I had in mind when I designed the webquest. I was completely defeated after my first attempt implementing the webquest with my students in the lab, but I was determined to try again. I decided to put the PowerPoint in a the Public Drive on our school’s network, and see if it was easier to access. I even trained a couple of students to be helpers, and help the other students find the file. I got most of the kids on the webquest quickly this time, but when I got them on again, they were having issues getting the videos to load and the hyperlinks to work. So, again I caved and had my students go on sumdog.com instead. I quickly was realizing that the PowerPoint webquest functioned very differently when opened in my teacher profile than when it was opened in a student profile. After some fiddling around, I discovered that if I saved the PowerPoint as a Macro Enabled Show, that the videos loaded without issue, and it launched directly in slideshow, which helped because the students didn’t know how to launch a slideshow. I was disappointed at another failure, but felt confident I had found a workable solution. Learning from my Mistakes, or so I thought! Fast forward a few weeks and we were reading another informational text titled I am a Butterfly, about the life cycle of a butterfly. I sat down to watch the Steeler game, and I got to work on another webquest in PowerPoint. Again, I located my resources and began designing the webquest, inserting hyperlinks, clip art, action buttons, audio, etc. My aunt again, sent me lovely photographs of butterfly and caterpillars that she had taken. I even put some really cool butterfly animation throughout the webquest. I was really quite pleased with my final product, and I was hopefully that if I saved the file as a Macro Enabled Slideshow and put it in the Public Drive on the network that everything would go smoothly. I checked out the webquest when I got to work to make sure the videos were loading and the hyperlinks worked etc. Everything looked great. I saved it as a Macro Enabled Slideshow in a folder in the Public Drive were the students could access it. I opened the slideshow on my computer, and it looked great! I even turned on my projector and showed the students how they could find it on the computer once they got to the lab. I took them down to the lab, and I was pretty impressed that some of my students located the file quickly. I assigned them to be helpers. Quickly, I discovered that the videos were not loading, and the hyperlinks weren’t opening correctly. Some students clicking on the hyperlinks and nothing was happening. I discovered that these students had closed a pop-up that asked them if they wanted to enable the content. So, I had my students exit the slideshow, and reopen it. I made sure that they allowed the content to open. Other students were having an issue when they clicked on a hyperlink, but it would open the link up in the internet browser, which the students couldn’t access without exiting the PowerPoint slideshow. Some students on the other hand were able to able to access the websites that opened up in a small window in front of the slideshow, instead of behind. These students were able to successfully visit a couple of the websites. I also noticed that the computers were being slow, and many students got a bit click happy, and opened the same link over and over again. Then, I found out that one of the websites I had hyperlinked to was being blocked by our filter. Another complete computer lab failure! So, when all else fails make it a FREEBIE! After my issues implementing these webquests with my students, I figured others would have similar problems. If you are interested in trying these webquests for your students they are free in my Teachers Pay Teachers Store for the time being! Please let me know how they work for you! I am interested in getting your feedback! What is your favorite way to make a webquest for your students? Please share your webquest success and failures! This entry was posted in Technology Integration and tagged IWB, PowerPoint, webquest on December 30, 2013 by caitbajgier. Thanks for the positive comment! I really appreciate it! It can be rather embarrassing being brutally honest about one’s failures! So thanks! I really like this post because you were transparent in sharing what worked, and didn’t–something we all go through! I can relate! I especially liked how you stuck with it and didn’t abandon the great idea. Good job! Thank you! I appreciate your kind words! Inquiry-Based Learning, I’m All In!